Netc Signature Labels are absolutely top of the line. Special times require exceptional labels. Easily and quickly create your own Signature Labels with your message on the media. Insert your custom content and your bitmap images onto the media label. Netc Signature Labels  the message is the media! Get the message  download Netc Label System now! 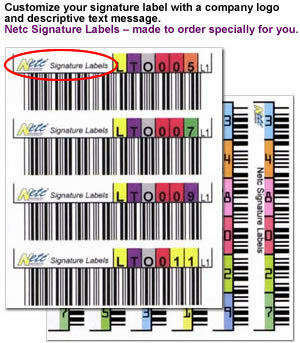 Netc Signature Labels, another label innovation from Netc  the media barcode label experts. Please visit our pricing guide to order your Netc Signature Labels now! Netc Signature Labels provide you with a simple, powerful and unique way to simultaneously add value and increase sales. Place customer content and bitmap images on the media label. Netc Signature Labels  autograph your work!